A setting book for Pinnacle‘s expansive Last Parsec science-fiction property, full of danger and opportunity. The jungle planet Leviathan teems with mammoth lacerauns, savage beasts of enormous size and cunning, potential trophies unmatched in any other star system. Intentionally undeveloped beyond a few tourist-oriented settlements, Leviathan nonetheless draws more than just adventure-seeking hunters, including researchers and those who would see the world left completely untouched. Both are more than willing to turn the tables on any would-be hunters. 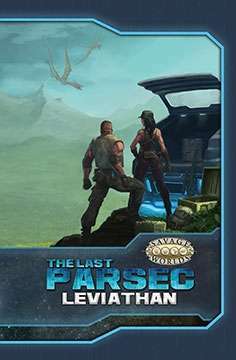 Leviathan is a setting book for The Last Parsec. It contains new locations and characters for the planetary system, new Setting Rules for Leviathan’s natural dangers, a Plot Point Campaign, Savage Tales, and a host of new creatures–especially the lacerauns.